There are many Hong Kong western franchised restaurants. Here, we are going to cover the most well-known ones, such as McDonald's, KFC, Pizza Hut, Starbucks and Häagen-Dazs. Perry, my hubby, rarely steps into McDonald's in US. But he loves to step into those in Hong Kong. According to him, the food is great and places are nice and clean. So, every time we go back, there's a routine to have our breakfast in McDonald's every morning. Also, according to him, a few of them serve better food, such as the one close by the Pacific Place and the Festival Walk. Our latest visit in Hong Kong proved that he was 100% correct. In 2005, my trip back to Hong Kong, I realized that almost every McDonald's renovated and each has its own theme. In my opinion, it's really nice to enjoy the different atmospheres in different locations. In 2012, I saw that most McDonald's had been renovated again. Some of them open 24/7 which was great. The one close to the City Garden Hotel Hong Kong, where we stayed, does that. The theme of these newly renovated McDonald's is very similar to each other. What amazed me was that we somehow came across a branch that it still had the theme of the well-known McDonald's characters such as Ronald McDonald, Grimace and so forth. It was like walking in the memory lane. To adapt into one's culture, this Hong Kong western franchised restaurants chain always have something special that you may never have any chance to try in the world. I remember that they had teriyaki burger. Their breakfast have some Chinese fusion options as well. McCafe has been well-developed since the early 2000s. 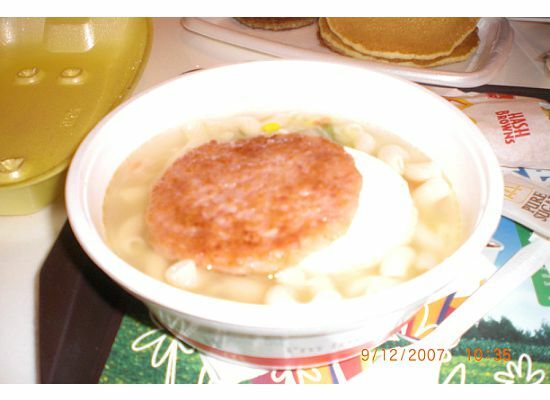 The picture on top of this page was taken in Hong Kong McCafe in 2007. 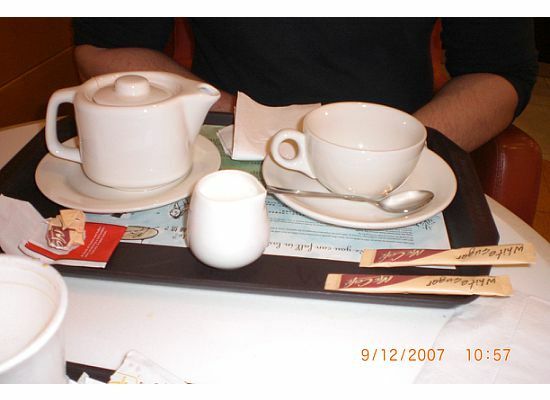 That whole tray of tea was brought to the table by the staff. Almost every child in Hong Kong would love to have their dream birthday party in McDonald's. Parents who can afford it will go to this Hong Kong western franchised restaurant giant. A spot inside the restaurant will be held for a full hour for the party. It's not very big. The largest space is about 100 sq. ft. There will be a PR helping you to arrange the party favors, planning the games for the kids, taking orders of all your guests. 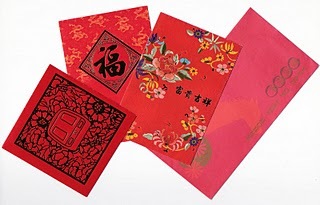 In the Chinese culture, the host pays for everything. In other words, no matter what your guests order, you pay for it for adults and kids. You will find every McDonald's in Hong Kong is packed with people. But don't think that it will take forever to get what you want. You will be amazed by the speed and efficiency, one of the traits of Hong Kong people, behind the counter. When we went back in 2007, we realized that Hong Kong McDonald's started a new practice. You line up to place your order and then line up again to take what you ordered. Perry was very upset. To him, the way how Hong Kong McDonld's used to run was perfect and they changed it to the way it is done in the US that doesn't work very well. Hong Kong McDonald's marketing was recognized as the most successful in the world. In late 1990s, (I think it could be around 1998), there was a McDonald's Snoopy collection campaign. For 28 days, if you bought a McDonald's combo after 11am, you would get a FREE Snoopy. And you could get 28 different Snoopys if you went to McDonld's every day. I was working in a Korean company in Tai Koo Shing (a great place to shop and make sure to check out the supermarket in Jusco while you are in the area) back then. Passing by McDonald's was a must every day. For that month, everything was set up during lunch time for people lining up to buy the combo. Many people were after the Snoopy so they gave away their meals to the homeless people. Believe it or not, these homeless people complained about having McDonald's meals every day. They were so tired of it. Some people flushed it down the toilet and plugged them up. For many Hong Kong businessmen, Hong Kong McDonald's is definitely a profit-making business. One of my uncles did think about getting a franchise for McDonald's in the early 1990s. While we are talking about Hong Kong Western Franchised Restaurants, McDonld's, let's talk about its competitors, Burger King and Wendy's. Burger King was in Hong Kong in the 1980s. I remember one close by our house back then when we still lived in North Point. But they never got as big as McDonald's. They closed down all stores a few years later. Wendy's had been in Hong Kong for a few years, too, which was way after Burger King closed down. It came in around the 1990s and closed down before 2000. Let's switch to another giant - KFC was opened in the late 1970s and early 1980s in Hong Kong. But during that period of time, Hong Kong people didn't quite accept it. It closed down. It made a big come back in the late 1980s and early 1990s and keeps prospering till this day. Compared to other Hong Kong Western Franchised Restaurants or local chain fast food shop, KFC has stuck to its original menu the most. It serves breakfast, lunch and dinner. If you realize that you don't enjoy other Hong Kong food as much as you expected, but American food, this may be a place for you to go to because KFC does stick with their original menu. There's only one thing that you would see in KFC that really is the effect of the Hong Kong food culture. It's called the "Portuguese Egg Tart". Unlike KFC, Burger King and Wendy's have never come back. I think that McDonald's has already dominated and saturated the Hong Kong Western Franchised Restaurants market. Hong Kong Starbucks is my all time favorite. It is actually not a totally Hong Kong western franchised restaurant. It is run by a big Hong Kong restaurant chain, Maxim. They don't have any Chinese fusion coffee or snacks. They do have some great bakery goodies that you can't find in any Starbucks in U.S.
Perry always makes sure that I have their spinach quiche (it's actually a pie, more than a quiche 'cos no egg is added) when we are there. They always warm it up in the oven and bring it over to your table. They also have seasonal specials. If you happen to enjoy their coffee in the store like I do, you may get a free sampler. It doesn't happen frequently. But I did have a very good experience one year of trying a white chocolate coffee sampler before Christmas time in the one close to the Tsim Sha Tsui Star Ferry station. Most Starbucks in Hong Kong have big comfy sofas. You rarely find one without. My best friend, Elaine, loves to go to those where you can enjoy the Hong Kong Victoria Harbor view (coming soon link to Junk Boat ride page). If you are lucky enough to get a table next to the window, from my point of view, that is one of the most enjoyable moments in life. You can find the Hong Kong Starbucks with harbour view in World Trade Centre, near Ocean Terminal and Harbour City. The Starbucks in Prince Building has a very peaceful atmosphere. 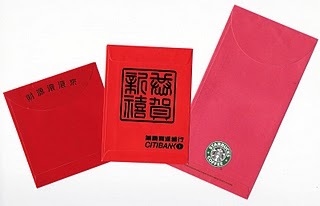 During Chinese New Year, many companies in Hong Kong give out red pocket envelopes for free with their logos on them. Since I love Starbucks so much, I saved it as a collection. Hong Kong Pizza Hut and Häagen-Dazs are 2 other big Hong Kong western franchised restaurants. Of course, they are not as big as the above that we covered earlier. Hong Kong Pizza Hut serves many fusion pizzas. They have the Chinese, Japanese and Thai fusion pizzas. To me, they always taste great. To get a table from one of the restaurants is always difficult. Just like Hong Kong McDonald's, they are packed most of the time. Renovation in Hong Kong Pizza Hut is always bright which has the similar atmosphere as McDonald's in US. One of the most popular dishs in this Hong Kong western franchised restaurant is their vegetable and fruit salad. You get a bowl and you can get as much as you want, but only for one time. It is only limited by your imagination. If you happen to be there, pay attention how people stack up that bowl. It is quite entertaining. Some people are so proud of what they do in stacking up their bowl of salad. The last Hong Kong western franchised restaurant that we are going to talk about is Häagen-Dazs . That is one of the musts for Perry when we visit Hong Kong, especially the one in the basement of Time Square. There are big comfy sofas. The lighting is so romantic. The design of the menu is so creative, not to mention the dishes available inside the menu. One time, my whole family went there. We ordered a family size ice-cream fondue. The ice-cream is shaped like melon balls. It came together with some fresh fruit. You dipped the ice-cream and the fruit into the fondue of melted chocolate. Men.....it was so good. If you want to have just a few scoops of ice-cream, feel free to try different flavors. Hong Kong has tons of great ice-cream flavors that you could never get anywhere else in the world. If you happen to be there around the Mid-Autumn Festival, check out if they have any ice-cream moon cakes. If you are a food adventurer, you will definitely find these Hong Kong Western Franchised Restaurants food inspirational. If you are not that adventurous, I am pretty sure that you will find something you like. Check out my blog for more simple recipes inspired by the Hong Kong western franchised restaurants food.